Every country in the world understands the need for global trade rebalancing. Yet, politicians have done nothing but take stances that mathematically cannot work. Germany wants the rest of Europe to raise exports and become more competitive while simultaneously protecting its export machine and imposing numerous austerity measures on the rest of Europe. Mathematically, it cannot happen. China wants to wean itself off an export model but does not want the pain associated with measures that would actually increase domestic demand. Mathematically, it cannot happen. Japan wants to raise taxes, increase consumer spending, and protect its export model, all at the same time. Mathematically, it cannot happen. The US needs to reduce its budget deficit, rein in pension promises, and fix various structural problems (many associated with public unions – the same as in Greece and Spain), but lacks the political will to do so. Mathematically, U.S. deficit spending is not sustainable. In all four situations above, I have described situations that are mathematically impossible, not just unlikely. With the world’s worst demographics, Japan has no politically acceptable solution to its trade imbalance problem. Japan is a “bug in search of a windshield” as writer John Mauldin puts it. With the above principles in mind, please consider a few snips from an email from Michael Pettis at China Financial Markets regarding “Japan’s Debt Disaster and China’s Non-Rebalancing Act“. China’s current account surplus has declined sharply from its peak of roughly 10% of GDP in the 2007-2008 period to probably just under 4% of GDP last year. Over the next two years the forecast is, depending on who you talk to, either that it will rise significantly, or that it will decline to zero and perhaps even run into deficit. The Ministry of Commerce has argued the latter and the World Bank the former. I am not sure which way the surplus will go, but I would argue that either way it is going to be a very strained and difficult process for both China and the world. On the one hand if the Ministry of Commerce is arguing, as many do, that the rapid contraction in the surplus indicates that China is indeed rebalancing and will continue to do so, I think they are almost certainly wrong. China is not rebalancing and the decline in the surplus was driven wholly by external conditions. In fact until 2010, and probably also in 2011, the imbalances have gotten worse, not better. For proof take a look at the graph below sent to me by Calla Weimer, a Visiting Scholar at the US-China Institute, University of Southern California. 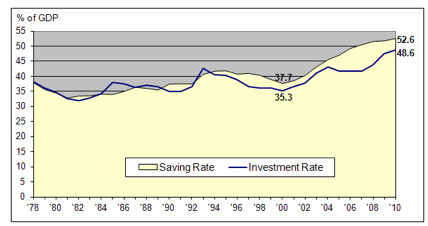 It shows China’s total savings rate as a share of GDP as well as China’s total investment rate. As you can see, both numbers are extraordinarily high. The current account surplus, of course, is equal to the excess of savings over investment – any excess savings must be exported, and by definition the current account surplus is exactly equal to the capital account deficit. This is the standard accounting identity to which I have referred many times in my newsletters. As the graph shows, the last time investment exceeded savings was in 1993-94, and during that time China of course ran a current account deficit. So is China rebalancing? Of course not. Rebalancing would require that domestic consumption rise. Is the consumption share of GDP rising? From the graph it is pretty clear that consumption has not increased its share of GDP since the onset of the crisis. If it had, the savings share of GDP would be declining. What then explains the decline in China’s current account surplus over the past three years? The graph makes it pretty obvious. The sharp contraction in China’s current account surplus after 2007-08 had was driven by the external sector, and in order to counteract the adverse growth impact Beijing responded with a surge in investment in 2009. Meanwhile investment continues to grow and, with it, debt continues to grow, and since the only way to manage all this debt is to continue repressing interest rates at the expense of household depositors, households have to increase their savings rates to make up the difference. Can China’s surplus rise further? Declining trade deficits around the world require declining trade surpluses. Part of the adjustment in Europe I suspect will be absorbed by a contraction in Germany’s surplus, but the Germans of course are resisting as much as possible since they, too, are dependent for growth on absorbing foreign demand. I don’t know how this will pan out, but certainly Europe as a whole expects its trade surplus to rise, and if instead it begins to run a large deficit, German growth will go negative and the debt burden of peripheral Europe will be harder than ever to bear. Don’t expect Europe, in other words, easily to accommodate China’s need for a growing trade surplus. If foreign capital flows to Europe increase – perhaps as China and other BRICs lend money to Europe – Europe’s exports will certainly decline relative to imports, but because this means much slower growth for Europe, I don’t think it is sustainable. Tokyo is clearly worried that it is running out of time to manage the debt, and the indications are that it has finally become serious about reducing its debt burden. What’s more, Japan’s current account surplus has already contracted substantially in the past two years, and in January it ran the biggest monthly trade deficit it has ever run – $5.4 billion, although the early Spring Festival this year may have distorted the number. How can Japan reduce its debt? I am no expert on Japanese policies but according to much of what I am hearing Tokyo is planning to raise taxes further, especially consumption taxes, and to use the proceeds to pay down the debt. [Mish comment: Japanese government officials without a doubt want to hike taxes. Please consider Japan’s Prime Minister Seeks Doubling National Sales Tax; No Winning Play for Japan. In addition Tokyo and the business community are putting downward pressure on wages in order to increase the competitiveness of the tradable goods sector. The Financial Times article Low wages compound Japan’s grim prospects highlights the problem. Bonuses have been coming under heavy pressure in Japan for years as part of a wider effort to restrain incomes. And while workers around the developed world have been complaining of a squeeze on incomes over the past two decades, in Japan thinner pay packets fuel wider deflation. That makes it even harder for the government to rein in its runaway debt and for the central bank to use monetary policy to boost growth. Yikes! This could turn out to be a huge problem for China and the world. Why? Because raising consumption taxes and reducing wages will push up the Japanese savings rate substantially. Either action pushes the growth rate of disposable income down relative to GDP growth, and lower disposable income usually means lower consumption – which is the same as higher savings. These policies will probably also reduce the investment rate. Lower Japanese consumption, after all, should reduce business profits and so reduce the incentive for expanding domestic production, while pressure for austerity should restrain or even reduce government investment. By definition more savings and less investment mean that Japan’s trade surplus must rise. Japan, in other words, is planning to move backwards in terms of rebalancing. That bit of “good news” is certainly not good news for the commodity exporting countries like Australia, Canada, and Brazil all of which have their own problems, especially Australia and Canada with enormous property bubbles. Moreover, Europe is an absolute basket case. Greece, Portugal, and Spain are in economic “depressions”. Expect European balance of trade problems to worsen until those countries exit the eurozone. Unfortunately career politicians like German Chancellor Angela Merkel have bet their reputations on preserving the impossible. Eventually, Germany is going to pay an enormous price for European imbalances and ECB president Mario Draghi’s LTRO program, now hailed as an enormous success, is likely to be viewed as anything but success when countries exit the eurozone piecemeal down the road. As I said upfront, every country in the world understands the need for global trade rebalancing. Yet, politicians have done nothing but take stances that mathematically cannot work, some of which are likely to further exacerbate the problems. This economic toxic brew will simmer until the pot explodes in a massive currency crisis at some unknown point down the road.